Produced For – Deep Worldwide Music, Inc. Original produced for Deep World Wide Music, Inc.
B1: remixed for Wikitman Productions. 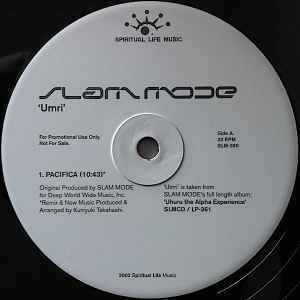 "Umri" is taken from Slam Mode's full length album "Uhuru - The Alpha Experience" (SLMCD / LP-361). The original version of the track "Umri" is also featured on the 2x10" promo "Alpha Outakes" (Spiritual Life Music, TX-003). For promotional use only. Not for sale. An incredible record. Equally incredibly difficult to find, rumours circulate that only 75 were pressed. The Kuniyuki remix of "Pacifica" is a beautiful journey, his trademark percussion instruments weaving a delicate groove whilst the vocals from Slam Mode's "Umri" draw you in with their warmth. A beautiful record. This is a masterpiece of Kuniyuki Takahashi. He sliced the original version into a totally different dimension, so it is more spiritual. The John Wicks version is also great and is a more uptempo thing.